Out of the hot kiln, my ceramics are ready. All of my ceramic work is distinctive, one- of- a- kind: unique conversation pieces meant to be held: not meant for dinnerware use. Enjoy the variety of pottery, sculpture, & wall art. 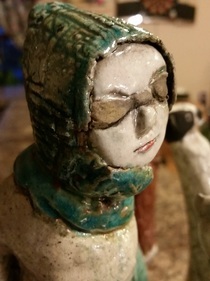 ​The artist, Kathy Kerner creates ceramic that is very, low fired. The pots, pitchers, and vases never get hot enough in the kiln to seal, so will not hold liquid very well. 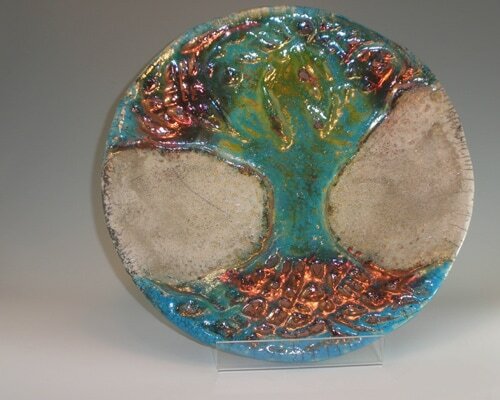 Special raku copper glazes make the work non-functional as dinnerware. ​Right out of high school,Kathy attended Layton School of Art & Design, Milwaukee, WI. "Because the curriculum was intense at Layton school, we learned our subject matter and technical skills better than most," she declared.The School required students to be in art classes from 8 a.m. until 4 p.m., Monday through Friday, which emulated the world of work. ​Later, she earned a degree in art therapy, and got her art teaching certificate in Wisconsin. Recently retired from 20 years of teaching in public school, she teaches at her home studio. Her work is represented in Lake Geneva, WI. and shows in galleries and museums.